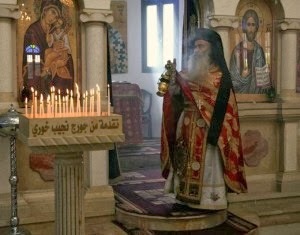 (Constantinople) The Orthodox seek unity with one another. The assembly of Primates of the Orthodox Church has begun In George's Church of the Ecumenical Patriarchate of Constantinople. The Patriarchate of Moscow thereby is also searching for the solidarity and support of Orthodoxy in the Ukraine crisis and will probably get it. In Constantinople, now Istanbul, today, the Synaxis of the Primates of the Orthodox Churches has opened. This is something the Ecumenical Patriarch of Constantinople, Bartholomew I, has invited - not without some rumblings of the Russian Orthodox - to discuss a meeting of the Holy and Grand Council, the whole Orthodox Church that could begin, after 50 years of announcements and preparations, perhaps in 2015. Will the Holy and Grand Council of the Orthodox Take Place? The crisis in Ukraine, which is also an East-West conflict, are of particular importance to today's meeting to understand the direction in which the inner- Orthodox relations between the autocephalous Churches could develop in the coming years, but also the ecumenisml between the Orthodox Churches and the Catholic Church. A number of recent signals suggest that in the three-day meeting at the Phanar, at the seat of the Ecumenical Patriarch, the Orthodox Churches will move closer together after years of bickering and divisiveness and consolidate again its close internal unity.. It features a new dynamic of recovered unity with a Divine Liturgy celebrated on the 9th of March, Sunday, the day of the " Triumph of Orthodoxy ". This still refers to the first millennium triumph of the veneration of icons against the iconoclasts, but in a broader sense, the triumph of Orthodoxy over the heretics. It is the triumph of the "small, persecuted flock," a "triumph of the martyrs and confessors," as it committed to Orthodoxy. For a long time the participation of the most influential Orthodox Church leader, Patriarch Kirill I of Moscow was not certain. Yet the Patriarch of Moscow and All Russia has finally traveled to Istanbul. For him, it comes to receiving the support of all the Orthodox Primates for the second part of his title. According to Moscow's understanding of the tripartite Russia (Great Russia, Little Russia, Belarus), his primacy extends not only to the state of Russia and ethnic Russians but also through Ukraine and Belarus. The question of the autocephalous Ukrainian Orthodox Church, which during the crisis has come down on the side of the anti-Russian independence movement is, therefore, not to affect the assembly. As it stands, all canonically recognized Orthodox Churches will continue to repudiate a canonical recognition of a Ukrainian Orthodox Church of the Kiev Patriarchate independent of Moscow headed by Patriarch Filaret of Kiev. Filaret, has been Russian Orthodox Metropolitan since 1966, he became after 1990, after the death of Pimen I his successor as Metropolitan of Kiev and throughout Ukraine. When Ukraine gained independence after the collapse of the Soviet Union, Filaret called for the autocephaly of the Orthodox church in the country, which Moscow rejected. In 1995, he called arbitrarily for Ukrainian Autocephalous Orthodox Church and the Patriarch of Kyiv and all Ukraine . This division of Orthodoxy in Ukraine has continued still, so that today three feuding Orthodox Churches face each other. Only the Ukrainian Orthodox Church of the Moscow Patriarchate is officially recognized, to which appends still the majority of Orthodox believers. Filaret was excommunicated in 1997 by Moscow and returned to the lay state. Despite various attempts by anti-Russian Ukrainian politicians speaking of the recognition, the Ecumenical Patriarch Bartholomew I, has not previously affirmed it. Although Ukrainian he has had 20 years of independence, the Kiev Patriarchate has not expanded its position, since the majority of Ukrainian parishes and monasteries belong almost entirely to the Moscow Patriarchate. Patriarch Filaret of Kyiv remains in the eyes of the recognized Primates as one excommunicated, who is also accused of giving titles and jurisdictions to schismatic groups and strange creations imparting to secularized priests to self-appointed priests and vagrants, dealing moving in various countries outside the Church control. There is talk of a "schismatic International," calling into question the apostolic succession of the Orthodox Churches undermines in some parts of the world and place. An expression that reflects the mood within canonical Orthodoxy on the subject. When U.S. Secretary of State John Kerry these days made his walk across the Martyrs' Square in Kiev, he was accompanied by various Ukrainian religious leaders. Right next to Kerry, more visible than any other, was Patriarch Filaret. On the Russian side, Patriarch Kirill I tried to restrain the conflict in Ukraine. All the more so, since Archimandrite Chaplain of Russian Military had designated the intervention in the Crimea as a "peace mission". Additionally, Kirill said: "Our nation is composed of people with different perspectives and political convictions, including those which are being faced on the barricades. The Church is located at the side of any party in the political struggle." These words are a message to Metropolitan Onufry they contain the current locum tenens of the Moscow Patriarchate in Kiev. Not only Moscow but also the Ecumenical Patriarch urges a closing of the Orthodox ranks. This not only has to do with the Ukraine crisis. At the same time, the unity will also strengthen the role of Bartholomew as primus inter pares, and thus guarantor and coordinator of Orthodox unity. Therefore, the "foreign minister" of the Moscow Patriarchate, Metropolitan Hilarion found many words of praise and grateful appreciation for Bartholomew and also Metropolitan Ioannis of Pergamon, the major theologians of the Ecumenical Patriarchate . Hilarion: "We must identify the problems of the world today, not those of the 70s"
Hilarion expressed in the preparatory meetings currently in session at the Synaxis the full readiness to participate for the first time in the preparation of the Holy and Grand Council, which has been considered by Moscow with little attention in the past: "New realities, new problems have emerged and we must, for our flock and the world, identify the problems that approach us today and not those which concerned the Orthodox Churches in the 70s and 80s of the last Century. " Impact on the Primacy Issue between Orthodoxy and Catholicism? Whether the new unity of Orthodoxy will have an impact on the willingness of Moscow to talk with the Catholic Church on primacy remains to be seen. Recently, Moscow has been deaf on this topic therefore, and for thus it did not recognize the leading role of the Ecumenical Patriarch in this question. However, there seems to e a relaxation in progress between Moscow and Constantinople. LOL! That's probably a safe bet. And America will never have its own Church, of course. Nonetheless, a meeting of the Patriarchs would be very positive (I hope) and needs to happen.